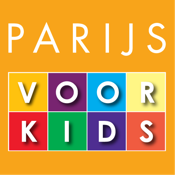 PARIJS VOOR KIDS - Dutch language book app for iPad. PARIJS VOOR KIDS is een spannende reisgids voor kinderen vanaf 8 jaar. Bezoek de populaire buurten en attracties en leer van alles over de geschiedenis van de stad. PARIJS VOOR KIDS is geschikt voor thuis en op reis. Parken, interessante wijken, musea, wetenschap, architectuur, sport, transport, eten, bezienswaardigheden, ontspanning en winkelen. PARIJS VOOR KIDS book has been popular with kids and parents in the Netherlands and Belgium since 2007. 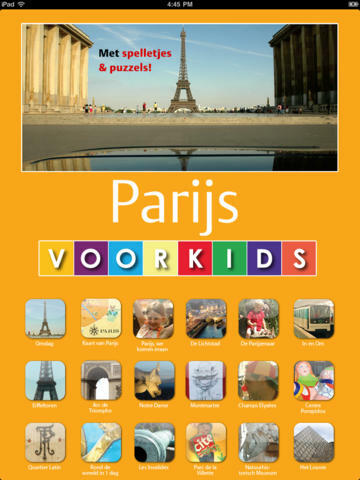 Now available for iPad, PARIJS VOOR KIDS is an exciting guidebook app created especially for children ages 8 and older. Young travelers will delight in discovering and exploring the city’s popular sites, attractions, and neighborhoods, while learning fun and historical facts. PARIJS VOOR KIDS is the definitive mobile reading companion during family outings, travel, general reading, and reference. - Provides portrait and landscape reading modes, page flipping effect, and return to last page read. Parks, museums, science, history, architecture, art, sports, transportation, food, shopping, markets, amusements, and fun. Eiffel Tower, Arc de Triomphe, Notre Dame, Pompidou Center, the Louvre, amusement parks, Paris Zoo, and more. Montmartre, Champs Elysées, the Latin Quarter, Les Invalides, Parc de la Villette, Versailles, parks and city squares.